Im still working on this article – please take a look at it again next week!! Astrogeographical position of the Presidential Palace at Brazilia for morphogenetic field level 4 which describes the energetical topics and atmosphere of the building itself: the astrogeographical longitude coordinate is located in self-protective earth sign Virgo sign of reason, health, strategical planning, adaptation, optimal use of ressources, protection of nature, gardening, parks. For a presidential residence Virgo supports careful calculation and planning. 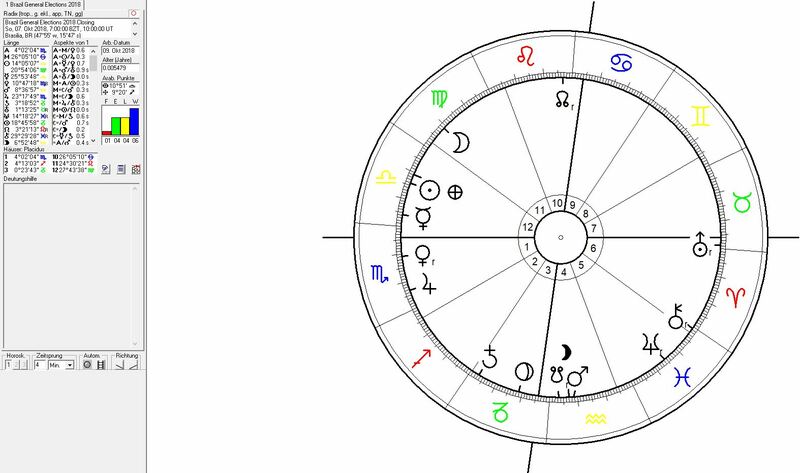 The astrogeographical latitude coordinate has 80 % of the building in self-centering emotional water sign Cancer sign of the moon, motherhood, pregnancy, fertility, feeling at home, emotional individuality and inheritance. As the sign of crabs Cancer resonates with the location of the construction site on the beach of Paranoa Lake. For a presidential seat Cancer supports dealing with the topics of the motherland, emotional inheritance, social issues and the topic of the homeland. The south end of the building is in highly magnetic, centralistic, royal fire sign Leo sign of the sun, light, self-esteem, glamour, gold and emotional self-expression. Altogether the relative figures of energetical qualities are 80% social care and emotional authenticity (Cancer) and 20 % for glamour and fascination (Leo). Astrogeographical position of the capital of Brasilia which describes the international, suprareginal resonance of the topics of the Brazilan government, political stability and development: the astrogeographical positions of Brasilia are 19° in fire sign Aries and 25° in air sign Gemini. This constellation could simply mean that the new capital was closely checked, examined and tested on that day in the first place. 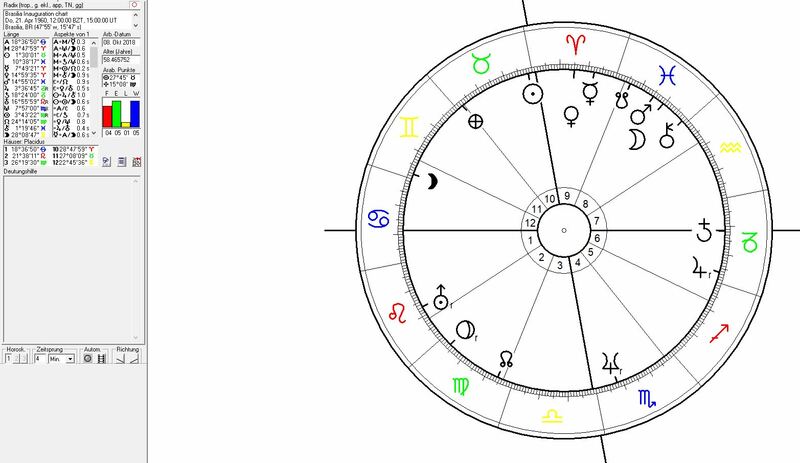 Venus the planet of grounding, stability, wealth and possession of territory at 15° Aries had not quite reached the exact degree of the capital yet but was getting closer. This could simply mean that the workers were still living in the town without women, the houses uninhabited, the markets not fully supplied and the population yet to come to town within the next four years (4 degrees-) that Venus was still having to progress (1 degree/year) to reach the capital`s exact astrogeographical degree. And Venus was square to Saturn – which simply explains the impediments that were still effective preventing the presence of the wives and women. The transit of Uranus over the exact astrogeographical position of Brasilia at 19°Aries was effective between March 2015 and April 2016. Uranus did of course stand for the need to reconnect with the country`s fuller potentials. 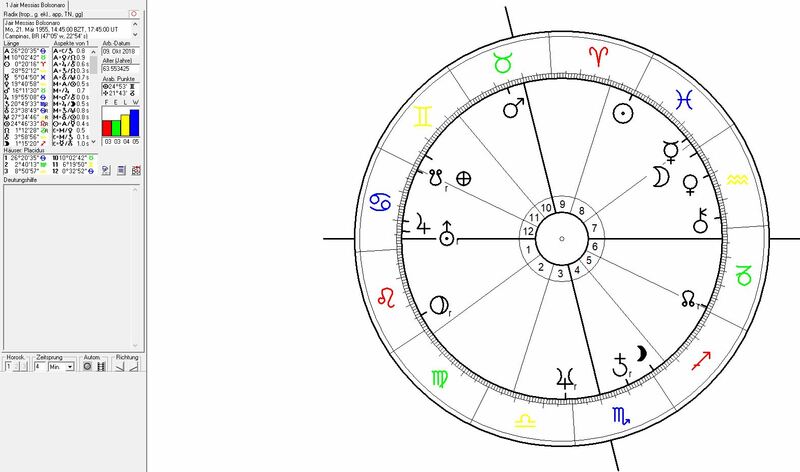 But Uranus` transit occurred under the influence of the globalized neofascist movement that has been organized in the course of Uranus` first return to Aries since the period of the rise of fascism between 1927 and 1934. 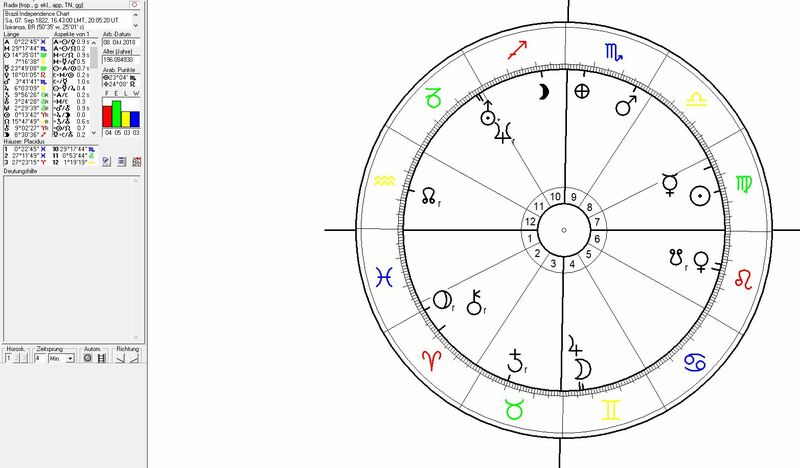 The effects of the Uranus transit seem to have destabilized the belief of the population in the ruling class of politicians and led to the suspension of President Dilma Rousseff with Uranus at 22°Aries conjunct and Pluto at 17°Capricorn square the 19°Aries astrogeographical position of the capital Brasilia on 12 may 2016. The 2018 general elections in Brazil take place during the transit of the heaviest threat onto the brazilian governments from Pluto at 19°Capricorn in exact square to Brasilia. Pluto stands for ideology, dogma, foreign control, hierarchy, trauma, pain and the need for transformation. The pressure on the government of Brazil from this transit has been effective since March 2016 and is now in late 2018 about to reach its final climax in November 2018 when Pluto will move away from the exact square position. The effects of this Pluto transit cannot be reduced to the danger of the neofascist dictatorship-orientated candidate Bolsonaro taking over power alone. In fact there is and has been a long chain of events before that – with the imprisonment of former President Lula in April 2018 as the climax of self-destruction of brazilian democracy. It seems like the rule of criminal organisations over large parts of the country may have caused larger parts of the population to resignate and opt for an authoritarian government instead. From an astrogeographical point of view the next option for liberalization could come under the transit of Neptune over the 25°Pisces square position to Brasilia`s 25°Gemini coordinate between April 2022 and March 2024. 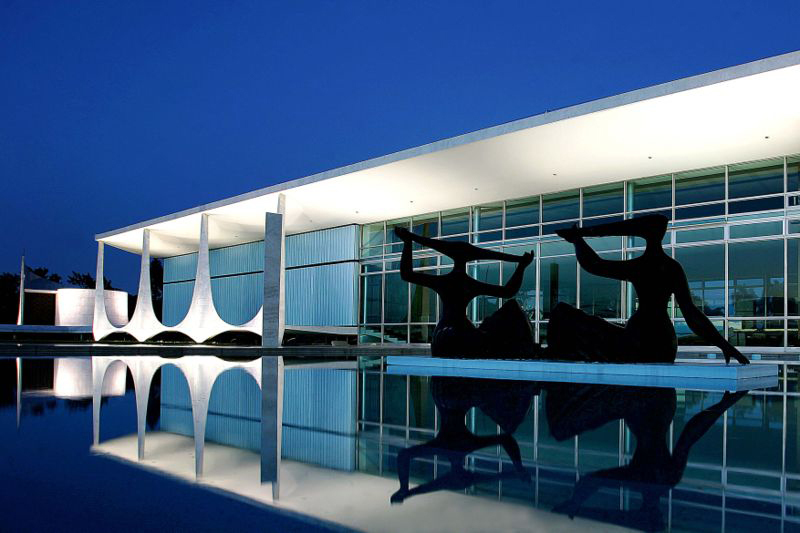 But Neptune in a square to the capital is also a clearest danger of foreign occupation of the democratic institutions -of Brazil – because this is what the capital Brasilia stands for and/or their suppression through the anti – democratic globally organized neofascist alliance which is propagated by the current US government. Jair Bolsonaro the representative of the neofascist globalization movement in the brazilian elections was born with a Jupiter-Uranus conjunction and his ascendant on the astrogeographical position of the presidential palace in Cancer and with its second coordinate in house 2 the house of possession of property and occupation of land. The combination of houses 1 and 2 at the place represent the danger of him seeing himself as the owner, personal ruler and representative of the institution – its master and not its servant. This constellation absolutely suggests the highest danger of the appeal for autocratic rule and dictatorship.